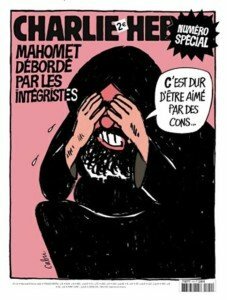 The Mohammad cartoon I like best from the French satirical magazine, Charlie Hebdo, is one that portrays the Prophet weeping. 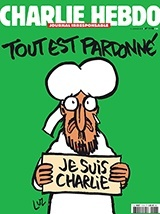 It was published almost a decade ago, on the cover of a 2006 issue, long before the Islamic terrorist attack of January 2015 in which a dozen people, mostly Charlie Hebdo cartoonists and other staffers, were slaughtered in their Paris offices by gun-wielding religious fanatics. One thing that’s clear about the cartoon, in addition to its wit, is that its target is Muslim fundamentalists who make outrageous assertions, demands, threats and engage in murderous acts. The specific context of the cartoon was a response to Muslim demonstrators protesting (in some cases, violently) against cartoons caricaturing Mohammad that had appeared in the European press in 2005. The weeping Prophet cartoon is not particularly directed at Muslim believers who may be members of oppressed and powerless minorities in various countries, perhaps including France, nor is it necessarily aimed at believers who are members of dominant majorities in theocratic Muslim nations. But even if it was aimed at believers in general, so what? It’s a politico-religious commentary and it makes its point neatly and, uh, pointedly. The principal figure of the cartoon could as easily have been a weeping Jesus, the antics of whose own fundamentalist followers provide its titular religious head plenty of cause for tears. 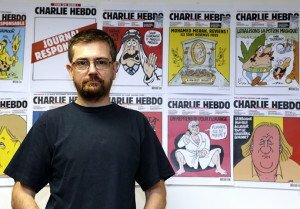 I intentionally mention the content of Charlie Hebdo magazine at the outset because a lot of people who have said, “Yes, the murder of the Hebdo cartoonists by Islamic terrorists was terrible, but...,” have based their “but…” on the allegedly offensive content of the satirical weekly. 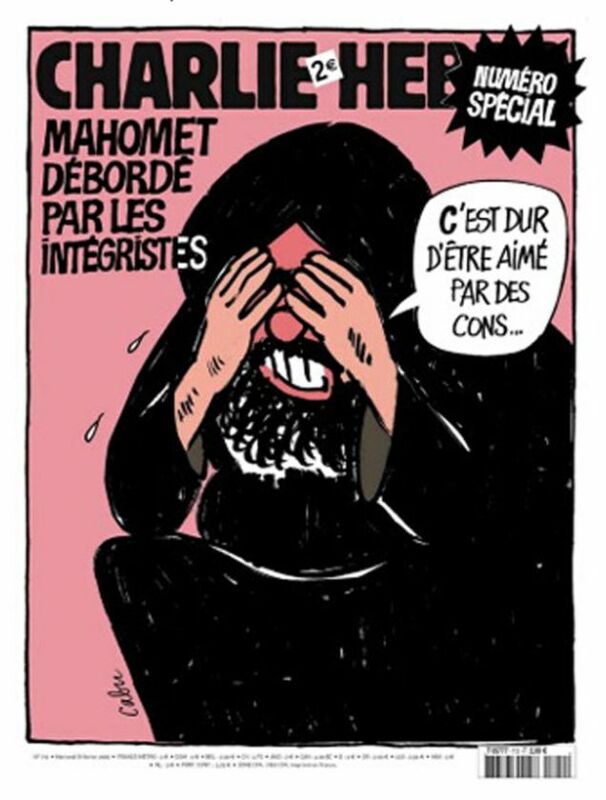 True, not all of CH’s cartoons about Mohammad — to say nothing of the magazine’s multiple other targets for satire — have hit their mark as precisely as the one I cite, and many have been cruder, ruder, and way more offensive than the one of the weeping Prophet, but for the murderers who killed the cartoonists, the issue wasn’t one of aesthetics. The ethical principle that the terrorists claimed was the right to kill anyone who criticized or made fun of their beliefs, and that claim included the notion that the mere visual representation of Mohammad was blasphemous and subject to lethal sanctions. 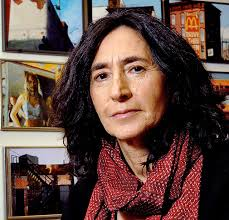 The reason for my cartoonishly rudimentary discourse, of course, is the current kafuffle about the decision by the U.S. branch of the writers’ organization PEN (I’m a member of PEN Canada) to bestow a Freedom of Expression Courage award on Charlie Hebdo at PEN’s annual gala in New York (May 5, 2015). It would have been an otherwise unremarkable event — after all, PEN is an international writers’ organization (currently headed by Canadian author John Ralston Saul) that focuses on defending freedom of expression, rescuing writers threatened or jailed for expressing themselves, and commending acts of courage in defense of free speech — except for the announcement by six writers slated to be “hosts” at the gala that they would be boycotting the affair because they disapproved of giving Charlie Hebdo an award for courage. 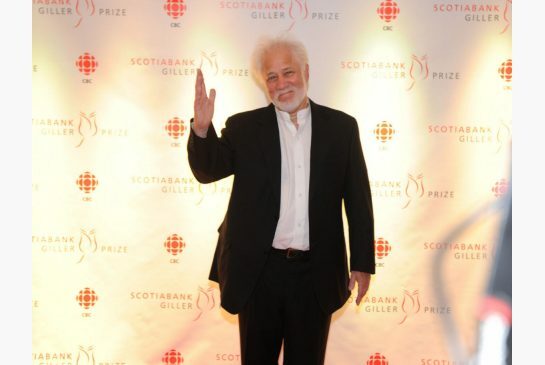 The dissenting writers are Peter Carey, Francine Prose, Teju Cole, Rachel Kushner, Taiye Selasi and the prominent Canadian novelist and poet, Michael Ondaatje. 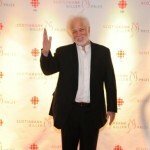 Well, yes, I’d be happier if Ondaatje wasn’t in that roster (but everybody has the right to their opinion, etc.). Former CH editor, Stephane (“Charb”) Charbonnier. The real question, I take it, is the one about whether this is a freedom of speech issue to which it’s worth paying attention. The last phrase of the previous sentence is relevant to the debate: civil libertarians (like myself) are perfectly willing to defend all sorts of speech they don’t agree with (say, homophobic, sexist, or Islamophobic speech) on the grounds that maximal free speech is a benefit in democratic societies. Such speech, as long as it doesn’t directly incite violence or constitute immediate endangerment (yelling “fire!” falsely in a crowded theatre), civil libertarians argue, ought to be tolerated. But of course toleration is not equivalent to automatically qualifying such expression for awards in the name of courage or other virtues. People like me, who are prepared to defend the content of Charlie Hebdo, have to argue that the cartoons — in general, but not each and every one of them — say something that “needs to be said” (to quote the phrase of the late German novelist Gunter Grass, as well as Prose herself). That is, I think the gala protesters are right to suggest that honouring Charlie Hebdo implies some approval of their general project, which is a satirical critique of various undesirable features of contemporary society. 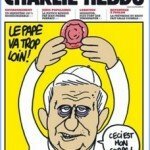 I have to argue that Charlie Hebdo is “working actively to tell us the truth about the world in which we live.” I’m prepared to do that, and to cite specific content, in addition to the weeping Prophet cartoon, that does that. 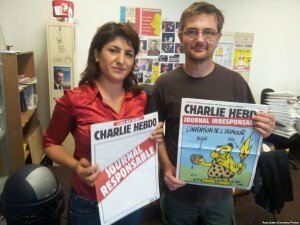 What was courageous about Charlie Hebdo was not merely publishing a scheduled issue of the magazine the week immediately following the horrific terrorist attack, but also publishing a cover cartoon of the Prophet suggesting that he, too, would be holding up a “Je suis Charlie” (“I am Charlie”) sign, as were millions of people around the world in the wake of the murders, as an explicit expression of the defense of free speech. The cartoon’s concept was elegantly witty in the midst of bloody horror: the paper’s cartoonists had been murdered allegedly for mocking Mohammad and offending Muslims, but here was Mohammad himself supporting the Charlie Hebdo cartoonists. The cover headline was “All is forgiven,” a pacific message with multiple (and theologically complex) meanings. I think that meets the standard Prose wants to set for PEN awards. The defense of Hebdo cartoons, in my view, can be extended indefinitely, and I could go on (and on and on… don’t worry, I won’t, but let me provide one more example): the magazine often has been accused of being an “irresponsible journal” and even Prose, in her op-ed piece referred to “fanning the flames of prejudice.” In one CH cover carrying the banner “irresponsible journal,” and the headline, “The invention of humour,” the cartoon shows a caveman bearing a burning torch in one hand and a container of oil in the other, self-mockingly suggesting that throwing oil on the flames is a venerable tool of comedy. A companion Charlie cover lays a large “responsible journal” banner across a blank page, poking fun at critics whose idea of responsibility is simply for CH to shut up. I not only like the layers of humour here, but I’d argue that this is work that ought to elicit the “admiration and respect” Prose calls for. In his interview, Peter Carey added, “All this is complicated by PEN’s seeming blindness to the cultural arrogance of the French nation, which does not recognize its moral obligation to a large and disempowered segment of their population.” This is an argument that has been widely invoked by the gala dissidents as well as other prominent commentators. The withdrawal by six of sixty writer-hosts participating in the PEN gala came on the heels of a speech by Doonesbury cartoonist Garry Trudeau — he was receiving a lifetime achievement George Polk Award for excellence in journalism — who said that, “By punching downward, by attacking a powerless, disenfranchised minority with crude, vulgar drawings closer to graffiti than cartoons, Charlie wandered into the realm of hate speech, which in France is only illegal if it directly incites violence. Well, voila—the 7 million copies that were published following the killings did exactly that, triggering violent protests across the Muslim world.” Leaving aside for a moment whether the Hebdo cartoons were an “attack on a powerless… minority,” Trudeau’s statement about the incitement of violence is an almost willful misunderstanding of the concept. The idea refers to violence directly incited by the expressed content against some particular group or person, not to “violent protests” caused by protesters taking offence at speech they disagree with or disapprove of. Whatever Trudeau’s merits (and they are many over a long career), he seems deeply confused about free speech theory. Several writers, including gala protester Teju Cole, took the view that Charlie Hebdo has been obsessed with attacking and denigrating Muslims. Again, the facts belie the claim. 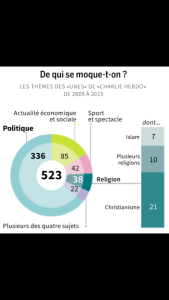 Ottawa Citizen columnist Terry Glavin posted a content analysis chart of Charlie Hebdo (it had earlier appeared in the French press) that clearly shows that over the past decade, religious topics and themes have occupied but a minority of the content (about 10-15 per cent) of Hebdo, and that material about Islam constituted only a minority of content about religious issues. The obsession appears to be in the eye of the beholder. 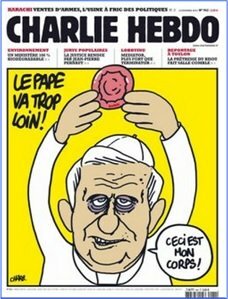 “The Pope goes too far,” says this CH cartoon in which the Catholic leader holds up a condom in place of the wafer. There are several questions to be asked about the relevance of the “powerless, marginalised minority” thesis. Peter Carey, while at once chastising PEN for stepping outside its “traditional role” by defending free expression against violent religious extremists, apparently wants PEN to take a particular (and much-contested) ideological line about political life in France, something that would indeed be beyond PEN’s non-partisan remit. Nor is it clear why PEN’s failure to support Carey’s preferred ideological views has much bearing on its recognition of the work of Charlie Hebdo. 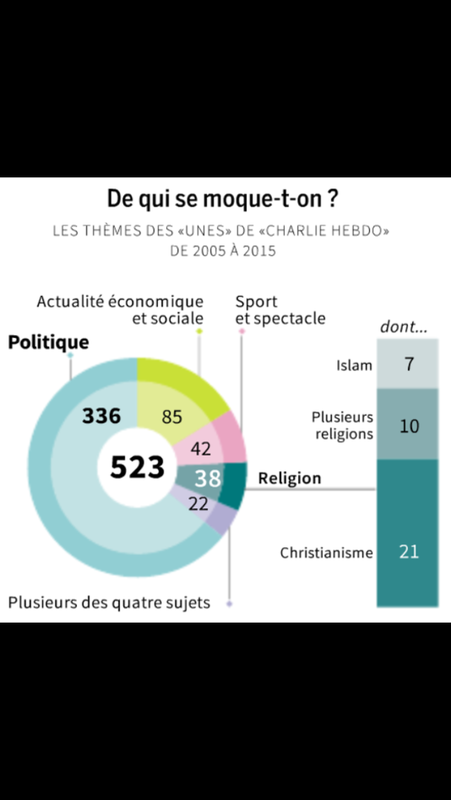 Similarly, it’s not at all obvious that Garry Trudeau’s claim, that the magazine’s small proportion of cartoons relating to Islam are an attack on French Muslims, is true. Finally, Greenwald’s charges are the most far-reaching of all. Apparently, one shouldn’t recognize Charlie Hebdo as saying some of “what needs to be said” without committing oneself to a comprehensive denunciation of Western imperialism against Muslim societies and diasporas. In Greenwald’s case, to paraphrase the Prussian general von Clausewitz who famously said that “War is the continuation of politics by other means,” it looks like journalism is the continuation of ideology by any means possible. Irrespective of the wide-ranging critique of the “war on terror” that many of us have made over the years, for Greenwald and people who share his views, their interest in history, which they emphasize, turns out to be quite selective and focused almost exclusively on U.S. imperialism as the source of all evils. There are days when Greenwald seems oblivious to the fact that some 3,000 civilians were killed at the World Trade Center by Islamic terrorists in 2001. Or that subsequent terrorist attacks in the intervening decade-and-a-half explain in large part why Muslim extremists have been the focus of counter-terrorism activities ever since the beginning of the millennium. But even if you accept Greenwald’s interpretation of history, it’s not clear why one can’t critcize U.S. foreign policy and at the same time agree with Charlie Hebdo’s satire on Muslim extremism and religion in general. Unless, that is, you accept the thesis that the magazine is attacking a powerless minority. But there’s reason to doubt that claim. For instance, Olivier Tonneau, a French radical who teaches at Cambridge, characterized the magazine this way: “Charlie Hebdo was an opponent of all forms of organised religions, in the old-school anarchist sense: Ni Dieu, ni maitre! It ridiculed the pope, orthodox Jews, and Muslims in equal measure and with the same biting tone. It took ferocious stances against the bombings of Gaza. Charlie Hebdo also continuously… campaigned for all illegal immigrants to be given permanent right of residence. Even if you dislike its humour, please take my word for it: it fell well within the French tradition of satire.” Tonneau isn’t alone. SOS Racisme, the French anti-racism NGO, called Charlie Hebdo the most anti-racist publication in the country. Christiane Taubira, France’s minister of justice, who happens to be a black woman (and has been caricatured by the magazine), spoke passionately at the graveside of the Hebdo murder victims The point here is that charging the magazine with attacking a helpless minority is a claim, an arguable claim, not a fact or the truth. 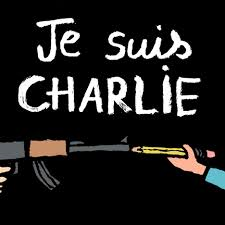 Naturally, since the announcement of the PEN boycott, supporters of the award to Charlie Hebdo have not been silent. Andrew Solomon, president of PEN America, in a letter to PEN trustees, acknowledged that, “It is undoubtedly true that in addition to provoking violent threats from extremists the Hebdo cartoons offended some other Muslims, as their cartoons offended members of the many other groups they targeted. He added, “At PEN, we never shy away from controversy nor demand uniformity of opinion across our ranks. We will be sorry not to see those who have opted out of the gala, but we respect them for their convictions.” The one place where I diverge from Solomon’s otherwise sensible, measured statement is when he says, “It’s a courage award, not a content award.” Yes, it is a courage award, but it’s also, to however limited a degree, a content award. The award can’t help but suggest some general approval of the content of Charlie Hebdo’s satire. That there is a content question is what makes the dispute over the award fair game. I think the dissidents are wrong about the content question and I’m perfectly willing to debate content with Charlie Hebdo’s critics. 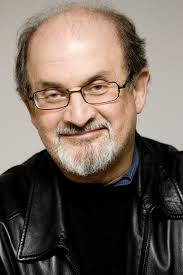 The most acerbic criticism of the dissenters, appropriately enough, came from the pen of Salman Rushdie. 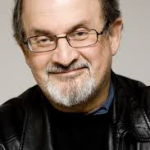 He’s the British-Indian novelist who was forced to live under police protection for years after the head of the Islamic Republic of Iran, the Ayatollah Khomeini, issued a fatwa against the writer in 1989, demanding Rushdie’s death for alleged blasphemy committed in his novel, The Satanic Verses. By the way, at the time of Rushdie’s condemnation by an official institution of Islamic religion (and not merely by loner extremists or a fringe group, it ought to be remembered), the president of PEN America was Susan Sontag. She didn’t hesitate a moment before issuing a statement of PEN’s complete solidarity with Rushdie and total support for his right to freedom of expression, a firm declaration made while many who should have known better, including writers, equivocated, fudged, and made arguments about the limits of free expression not all that different from those being heard today. There are one or two more things to be said. One has to do with civility and the surprisingly vigorous emotions that seem to be evoked by disputes like this one. There’s a real temptation to see those who disagree with you as malevolent opponents — after all, there’s the blood of the victims to consider, or the oppression of the disenfranchised. Strong stuff. It’s a temptation to be resisted. Um, no. Because Carey et al. are protesting the PEN gala, that’s not a justification for vowing to never read another word of theirs. As for the crack about fighting for tables at New York restaurants, well, that’s weak-witted hyperbole, and no doubt, there’s a great deal worse to be read in the squabbling below the salt one finds in the readers’ comments sections, under the news stories I’ve cited here. I notice that there’s something of a tendency to lean on the tropes of a sexist masculinity and to accuse the people you disagree with of being “wimps” or “wimping out.” Another temptation to be resisted. It’s better to remember that for the murdered cartoonists at Charlie Hebdo, it was the end of the world. This dispute isn’t.